Researchers at UConn are conducting a lily leaf beetle biological control project during the summer of 2016. If you grow lilies in Connecticut, have a minimum of 12 plants in the lily family (e.g., Oriental lilies, Asiatic lilies, Turk’s Cap lilies, or Fritillaria) in your garden and have lily leaf beetles feeding on them, we would like your help. We will be introducing two species of beneficial parasitic wasps in June and would like to collect lily leaf beetle larvae from May through August. The parasitoid wasps attack lily leaf beetle larvae, and over time these natural enemies will disperse from release sites and begin to spread through the state to reduce populations of lily leaf beetles. The wasps were first introduced in Connecticut in 2012 and have also been released in Maine, Massachusetts, New Hampshire, and Rhode Island, where they are establishing and starting to impact lily leaf beetle populations. Please contact Gail Reynolds, Middlesex County Master Gardener Coordinator (gail.reynolds@uconn.edu; phone 860-345-5234) if you would like to participate in the research project. 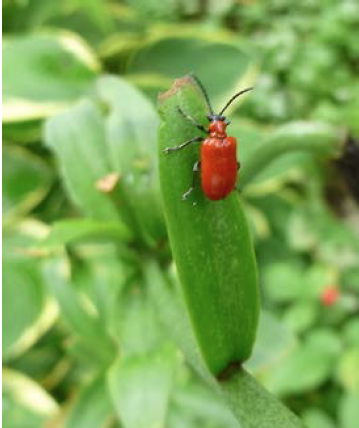 Information on lily leaf beetle biological control is available on the UConn Integrated Pest Management (IPM) website – click here for a fact sheet and an infographic on the project. About now, many of us gardeners have a stack of seed catalogs several inches high and have started combing through them acquiring all kinds of ideas and a long wish list. Before finalizing you orders, spend a bit of time going through any leftover seeds from the previous year. Many seeds, including tomatoes, peppers and zinnia remain viable for several years. So if you are just starting 2 ‘Sungold’ tomatoes each year, you might just need to purchase seeds every third or fourth year. On the other side of the spectrum are short-lived seeds whose germination declines with every passing year. They include vegetables such as onions, leeks, parsley, parsnips and sweet corn. It is best to purchase new seeds for these crops every year for best results. How older seeds are stored will also affect viability. They can be kept in their individual seed packets, small coin envelops, or in plastic or glass containers. Wondering what to do with the envelopes your bank teller or ATM hands you? Give them a second life storing seed collected from the garden. The key to seed saving is to keep them dry, not exposed to very hot or cold temperatures, and away from heat sources. I use a photograph box and organize my seeds into two rows – flowers and vegetables. Others use plastic bins while another option is putting them in photograph albums with pocketed sleeves. Any extra seeds which you won’t be using this year could be traded with friends, donated to community or school gardens or offered to local garden clubs. I’m not sure how many local readers have signed up for the CT 10% Campaign (http://www.buyctgrown.com/ct-10-percent) but purchasing seeds from Connecticut seed companies is just one more way to spend 10% of your food and gardening money locally. Connecticut has at least 6 seed companies with numerous offerings. The oldest is Comstock, Ferre & Co., which was founded in 1811 by Joseph Belden who advertised his first seed variety and price list in the Hartford Courant. His brother later took over the business selling seeds out of the 1767 home their father built which still stands in Wethersfield today. In 2010, Jere and Emilee Gettle purchased the company with the intention of returning it to its heirloom roots. One of their goals is to search and preserve the seed varieties listed in old catalogs and seed lists. They also are working on the restoration of the buildings and grounds on the historic site eventually creating a living history museum depicting the importance of agriculture and heirloom varieties. Now known as Baker Creek Heirloom Seeds/Comstock, Ferre & Co. and still located in Wethersfield, CT, the company offers vegetable, flower and herb seeds at their company store as well as online. Check out www.rareseeds.com to view their offerings, business hours and family friendly events. The Chas. C. Hart Seed Company, after being founded in 1892, is still being run 5 generations later by Charles C. Hart’s great-great grandsons. Beginning as a small, home-based, consignment seed package business, it slowly grew purchasing other seed businesses in Connecticut and neighboring states. Although the original wood building housing the Chas. C. Hart Seed Company burned in 1943; a new office/warehouse building was constructed on the historic Wethersfield site. Hart Seed is GE (genetically engineered) free and is typically sold online in bulk. 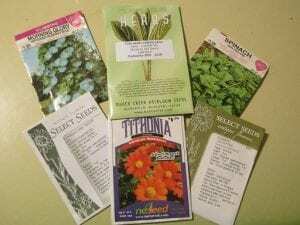 While one may not need 1000 or more seeds, which might be a catalog minimum, individual packets can be found at many Connecticut locations including garden centers, agricultural supply shops and hardware stores throughout the state. For a list of locations, visit www.hartseed.com. Although not as old as the previous two seed houses, NE Seed was founded in 1987 by two longtime friends with the purpose of creating a line of ‘high quality, chemical-free seed products’ reasonably priced and consisting of conventional, organic, heirloom and hybrid vegetable, flower and herb varieties. Seeds from their catalog are generally ordered in bulk but like Hart Seed, their smaller seed packets are available at a variety of local venues. NE Seed also offers bulk seeds of native forbs and grasses, which would work well when establishing a wildflower meadow or wildlife habitat plot. They are located in Hartford and at www.neseed.com. Select Seeds – Antique Flowers is a unique seed company located in Union, CT specializing in old-fashioned flowers but offering a limited number of vegetables and herbs, all non GE seeds, as well as annual transplants and perennials. What is unique about antique flowers, as well as heirloom vegetables, is that they are open pollinated which means that if the seed produced by the parent plant is saved and replanted, an identical plant or one very similar to the parent plant will grow. Seeds can be saved from year to year. With many of us New Englanders residing in older homes, the flower varieties offered by Select Seeds may well be the same ones our grandmothers and great-grandmothers were growing and also, quite compatible with the historic and architectural elements comprising our homes. See their complete listings at www.selectseeds.com. If one is focused on cooking what one grows, Kitchen Garden Seeds in Bantam, CT www.kitchengardenseeds.com may have some attractive offerings. Scroll through their seed offerings to find a variety of vegetables, herbs, flowers and specialty collections. There is a relatively large selection of Asian vegetables and even the telephone number of their seed specialist who will take your calls during the week. Request their print catalog or order on-line. This company offers numerous recipes using their herbs and vegetables and a nice assortment of horticultural tips. Lastly, while not typically for the general public, Colonial Seed of Windsor should be mentioned. They specialize in native grasses, sedges, legumes and other native plants that are needed for habitat restoration plantings, native wildflower meadows, forage fields and other challenging sites. Some of their seed is available through other commercial outlets like Hart Seeds but contact this company directly at www.colonialseed.com for more offerings. Connecticut residents are lucky as it is not that difficult to live and buy local in many areas of our state. Support local businesses, including seed houses and local garden centers as a way of supporting the businesses employing your neighbors and keeping local dollars in the local economy. 1. Replace the plants in hanging baskets, containers, and window boxes with evergreen boughs, berries and pinecones. 2. Disinfect, oil, and sharpen lawn and garden tools. Keep them in a dry storage area. 3. Don’t use fertilizer to melt ice. This creates nitrogen runoff issues that could damage local bodies of water. 4. Recycle your fresh Christmas tree by using cut branches as insulation over perennials. 5. Gently clean the leaves of large-leaved houseplants like dracaena, philodendron and ficus. Check for insect pests and treat accordingly. 6. Drain the fuel tanks of the lawn mower and any other gas-powered lawn tools. Check the belt and spark plugs, change the oil and sharpen the blades. 7. Remove snow and ice from tree and shrub branches by tapping them gently. It’s best to let the ice melt naturally. 9. Buy a few holiday plants to decorate your home such as poinsettias or try something a bit more unusual like a cyclamen or kalanchoe. 10. Use garden notes, photos and sketches to plan out your garden for the upcoming season. 1. Thin or compacted turf will benefit from core aeration and overseeding. 2. Mow your lawn any time the grass is 1 ½ times the normal height, For example, if you mow at a 3-inch height, don’t let the grass get longer than 4 to 5-inches. 3. 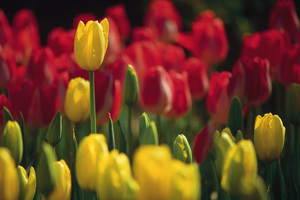 Remove spent blooms on tulips, daffodils and other spring flowering bulbs. The plant will focus its energy on growing new bulbs rather than producing seeds. 4. Hummingbirds and orioles return to northern states by mid-May. Clean and refill feeders to attract these colorful birds to your backyard. 5. Plant tomatoes, peppers and melons after all danger of frost is gone and the soil is warm. This is usually the last week in May. 6. Plant tomatoes in a different spot each year to reduce fungal disease problems. 7. May is an excellent time to plant a shade tree or flowering tree in your yard. 8. Plant dahlias, gladioli, cannas and other summer flowering bulbs. 9. Insert stakes or hoops now to prevent plants like peonies, asters and baptisia from flopping over. 10. Herbs can hold their own in early spring containers. Snip leaves to season dishes and create salad dressings. For more information visit the UConn Home and Garden Center or UConn Extension. Did you know, the University of Connecticut Home and Garden Education Center offers useful information on many gardening topics? Our horticultural information focuses on growing great plants, healthy lawns and controlling pest problems, all with minimal environmental impact. Numerous fact sheets are available on the Home and Garden Education Center website. If your problem is not covered by the fact sheets, email or call us at 877-486-6271.